Grab your mouse and comb and get to styling! The name says it all-this is Knot Your Average Pony-it is 100 % better! Another great twist on the traditional pony tail! There are so many and they are all so great. 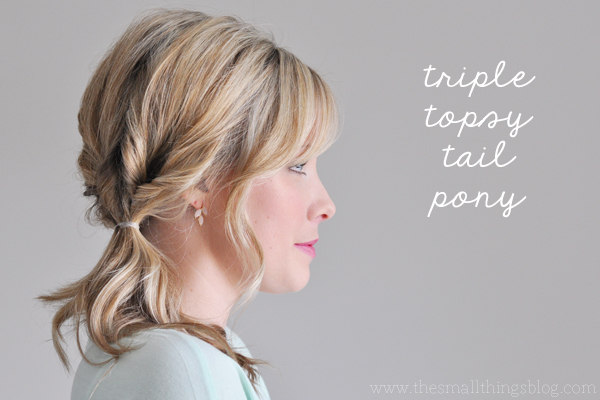 You need to try the Triple Topsy-Tail Pony. New spins on old standby’s are absolutely alright in my book! This spin on the ponytail is great for dirty hair days, bad hair days, and regular ole’ hair days! It looks more complicated than it is. Separate the hair into two sections. Tie hair in a knot.Repeat once or twice (it’s all up to you!). Pin it in place and you’re done! Cute and easy!